Voices on the Hudson is Back! 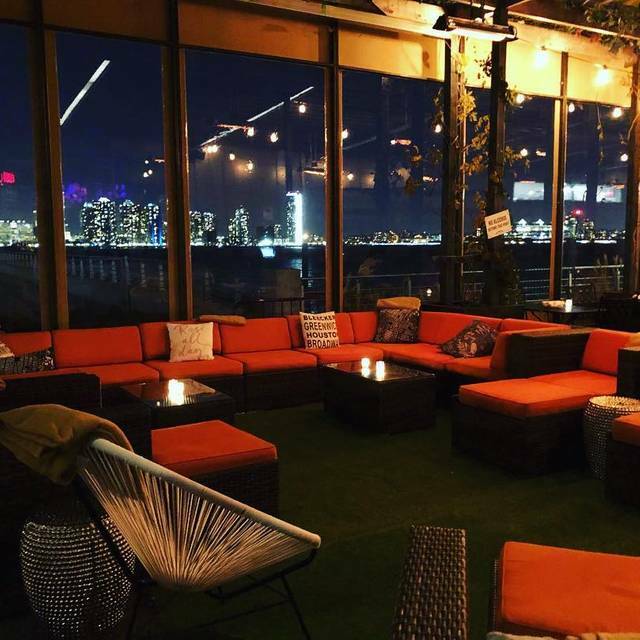 Our intimate concert series set against the gorgeous backdrop of the Hudson River and NYC's downtown skyline. Capacity is limited to 100 GA tickets and guests may enjoy a seasonal menu before and during the show. 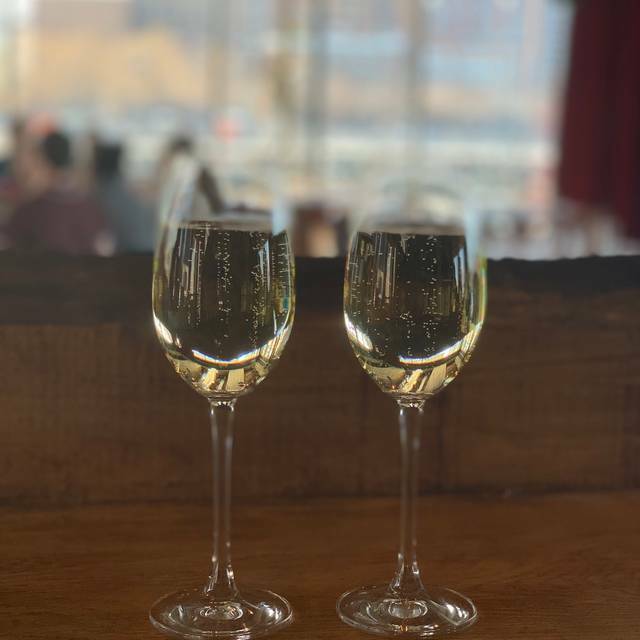 City Vineyard at Pier 26 provides the perfect river-side complement to our indoor venue in Soho! Private events at City Vineyard are designed to accommodate an array of events, including corporate cocktail receptions from 20 to 200 guests, birthday parties on the roof, small seated dinners, or just fun in the sun. A grape arbor shades our beautiful wine garden, while our roof deck features a spectacular view of the Hudson Estuary. Our dining room is also available in the colder months and year round. Leather seating, oak tables, and a handcrafted ceiling of wine barrel staves complete the simultaneously rustic and elegant wine country decor that has become our signature. Both indoor & outdoor spaces can be arranged for full buyouts depending on the season. Seasonal menus can be customized to accommodate groups large and small. 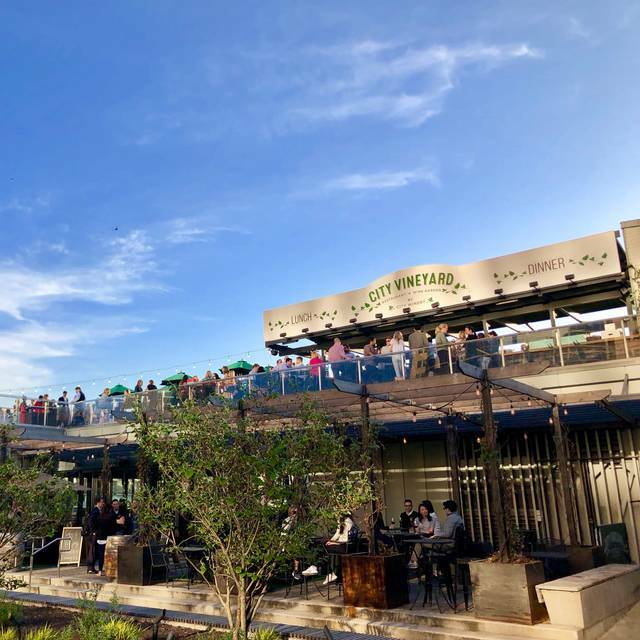 Offering year round riverfront dining, live music, wine on tap, incredible views, and a one of a kind rooftop bar & lounge, City Vineyard is the latest project by Michael Dorf, founder & CEO of City Winery. 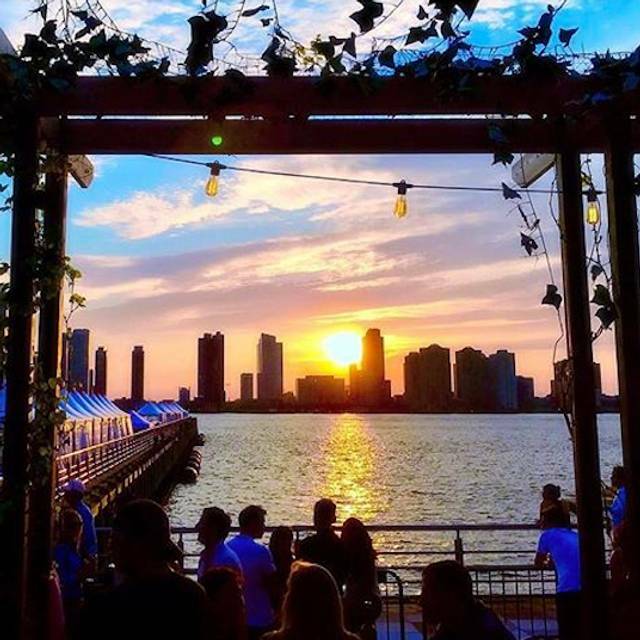 Located on Pier 26 in Hudson River Park, this unique space overlooks the Hudson River and provides the perfect setting to celebrate skilled winemaking and high quality food. Michael's vision of combined dining room, wine garden & event space is delivered by a team of seasoned wine & culinary experts. 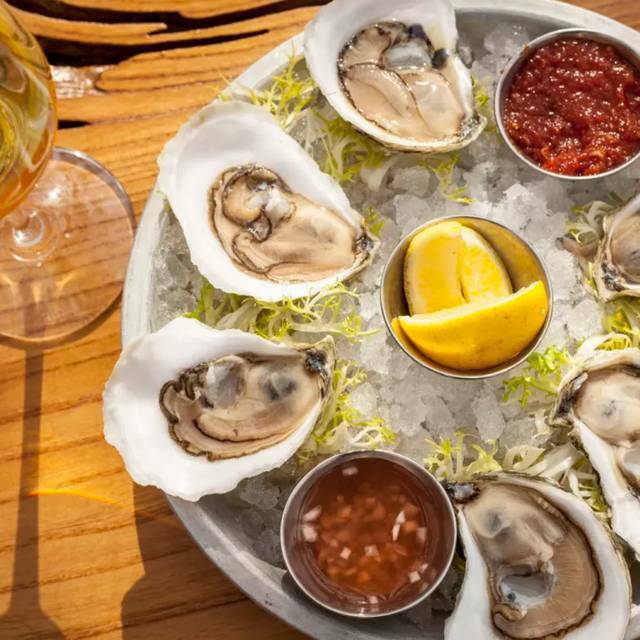 City Vineyard brings the seasonal bounty of upstate New York to the shores of Manhattan, and our exciting menu is complemented by a carefully curated wine list. 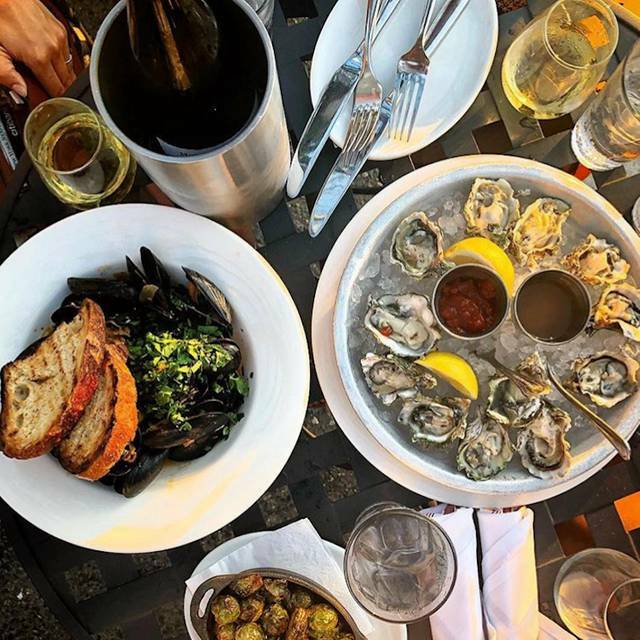 City Vineyard offers full-service dining in our main dining room & waterfront wine garden. 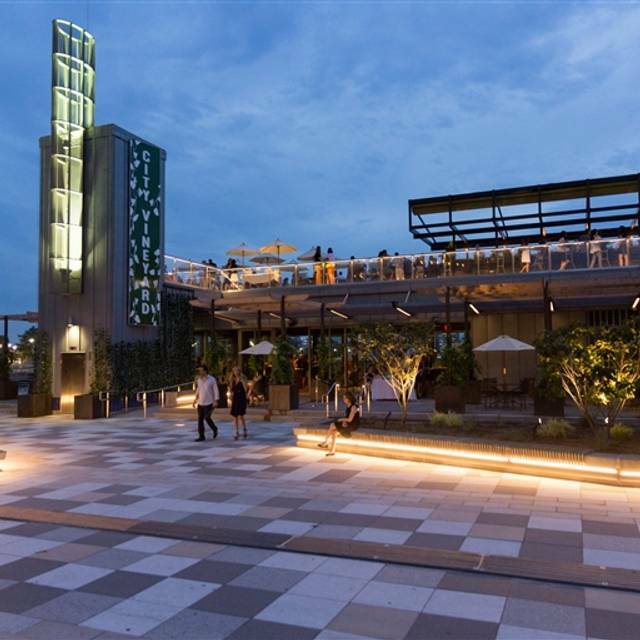 The Rooftop Bar at City Vineyard offers beer & wine service with incredible views! Please note, due to unpredictable weather, all reservations are for our indoor main dining room. Gruyere, tomato & caramelized shallot aioli, bibb lettuce, fresh Jersey tomato, kosher pickle. Flor our server was amazing! We loved the service and the hostess was kind enough to seat us inside on an early spring day when they were pretty packed. I can’t wait to come back. Mediocre, overpriced food with lousy service. The only reason to go here is location and wine. 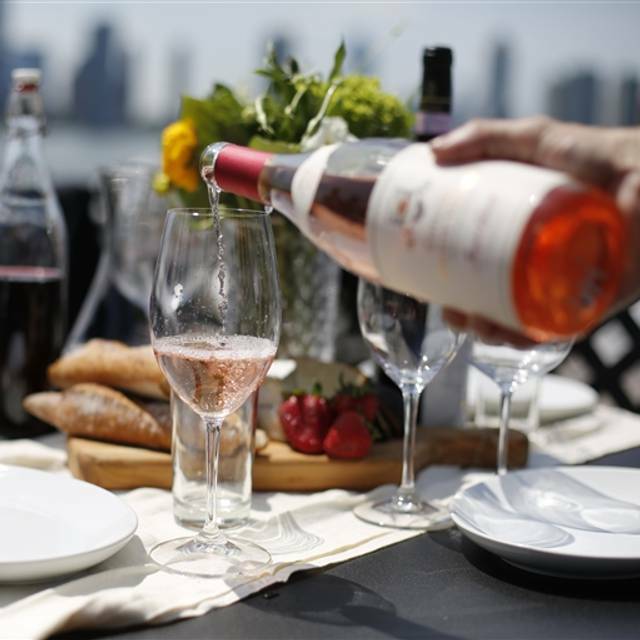 A truly wonderful selection of wines, tasty food options and spectacular outdoor seating! Service was slow. But to be expected for Sunday brunch. Food was good. Limited menu in my opinion. Would come back for the view and some drinks. Online the website seemed like a quiet, upscale restaurant. In reality, it’s a venue for affluent 20-somethings and 30-somethings-who-still-wish-they-were-20-somethings to drop $70 a bottle and get shwasty on a Sunday afternoon. Additionally, the river view is an abandoned pier, complete with manure pile for landscaping. Saw multiple people who had over-imbibed, was too loud to have a conversation, and the bathroom line wrapped around the building. If you want a party scene, that’s your place. Don’t go for a gentle, older afternoon, or any semblance of a conversation. GOOD PLACE TO HAVE A DRINK, NOT A GOOD PLACE TO EAT. We were there for my Mom’s birthday. Staff was friendly, our server Flor was wonderful. Burger was delicious. Can’t wait to go back and enjoy the rooftop! A girlfriend and I wanted to have a relaxing Friday night, so we went to City Vineyard on the first slightly spring day. CV has indoor and outdoor seating, but we were seated inside (weren’t asked our preference) next to the glass wall looking out at NJ. The place was starting to fill up, and we weren’t aware there was going to be live music starting soon. We ordered the mushroom risotto balls, the sopressata flatbread and a bottle of wine. The food was delicious and our waiter was very attentive! The band High Season played folksy songs, with various performers coming up (a harmonica player and a singer). My friend and I had enough time to catch up before the music started, because it wasn’t feasible to chat once the band started. I’d definitely go again when it’s warmer. The sunset view over NJ is simply beautiful! Food was great, service was just ok.
Brought mother in law to city vineyard die birthday dinner and it was packed with young intoxicated kids celebrating saint Patrick’s day. Also wasn’t informed when I received a call to confirm my reservation that a concert was scheduled. Bad experience. We love so much the ambiance of city view that we always take visitors there. The best show we have seen is the Brazilian Bossa Nova. That was very good!!! Quiet, chill, and pretty good food. The brunch option is great and they don’t force everyone on the table to participate. I imagine it can get pretty loud in the summer but it was chill in March. No complaints on food but nothing amazing. Thank you so very much for making our day one to remember. To our waiter Tony and Janelle at the front desk for making the day that more extra special. Amazing, love the food, view, everything is really good! Amazing place, friendly staff. My girlfriend loved it. Great food also. Went to hear singers; enjoyed the food and atmosphere. I had an amazing time with my friends. Flor was amazing. Great service, good food. We celebrated a birthday at City Vineyard during the cold winter. The heated patio was perfect and the crowd was minimal, making it a nice break from the cold. We loved the brunch food and the service was fantastic. We will absolutely visit again. The restaurant is situated in a beautiful location overlooking the pier. We went during the winter, but I bet it would be lovely during the summertime! The pier is dark at night (there were little to no lights out there), so you're really going to get the best views during daylight hours. The menu is small but sure to have something on it for everyone. We had risotto balls as the appetizer and they were unique and delicious! I had the salmon entree and it was good, but nothing particularly spectacular when it comes to salmon. We were seating in a big empty dining room in the back, possibly because there was live music happening in the front, so keep in mind if they have a music event, you can't really sit in there for dinner. Our server was distant but helpful. All in all, I liked it, but I bet I would enjoy it much more during the day and during the spring/summer! Amazing experience and I absolutely plan to come again. Even though the weather was really cold and rainy the atmosphere was great for brunch and our sever and bartender were incredibly nice. Chef Mike always manages to impress! They should keep dogs dispersed as much as possible. Tim! So sorry to hear we were out of the wine you wanted. We will make sure we keep our inventories stocked throughout the winter for you upon your next return. We're running some neat specials throughout the rest of the year. Thanks for your review, happy holidays! - Justin S.
A rainy night and a mediocre experience. Suggest that at least help customers with umbrellas. Had the mussels, they were excellent. Tap wines seem interesting, but we didn't try them this time. There was live music in the bar, we weren't fans but lots of others were so that's a fun neighborhood thing, and the location on the water is really wonderful. Service toward the end of our meal was pretty slow. But we'd definitely go back . I chose City VIneyard because I had guests from Europe that wanted a place with a view and most places with a view are very expensive. It was raining but still nice. Food was good, not great (my salmon was actually very good) but choice is very limited. We happened to have a waitress who could not have been nicer. I would certainly choose this place if you are going to a concert at the winery. As a restaurant it is OK, nothing special about the food, but I imagine without the rain, it would be a great place to have a snack, lunch or dinner on a nice day. Fantastic service and great for celebrating a special night! 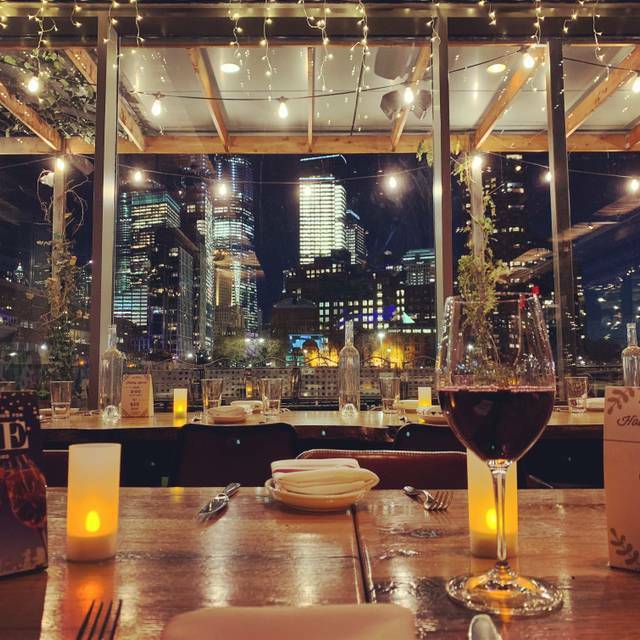 Quiet, after- Halloween, Sunday stroll down the Hudson River Park and decided to stop in to City Vineyard for a small bite and a night cap. Venue is adorable, even when the summer sections are closed off. Got seated in the enclosed outdoor area, which was heated and includes a great view of the river, Jersey and a bit of downtown. Our server Flor approached in a warm and helpful manner and we selected some delicious apps and wine. Charcuterie/cheese board was tasty which paired perfectly with our red wine. We were then visited by Alexandria the manager, who thanked us for stopping in and chatted with us about our choices and made some further recommendations for dinner. This made our visit! She was so charismatic and knowledgeable - we can’t wait to come back for brunch. Loved the service, the location and the food/wine were delicious. Happy to write this, and looking forward to our next visit! We love this restaurant! I waitress named Flor was wonderful!!! It was a great meal with excellent service!